After the 2011 earthquakes in Tōhoku, Japanese Telecom carriers decided to provide free public Wi-Fi hotspots to make communication easier in the affected areas. As a result of the powerful earthquake that hit Japan in 2011, media organizations and mobile phone carriers were prompt in providing temporary free Wi-Fi connectivity, in order to enable citizens and tourists in affected areas to communicate with their families. This has been very useful since the latest earthquakes hit the region of Kumamoto earlier this month. An “emergency public free Wi-Fi hotspot” was activated in the prefecture of Kumamoto by the three major mobile phone providers (NTT Docomo Inc., KDDI Corp., and SoftBank Corp). The Wi-Fi SSID, named “00000Japan”, was accessible to everybody, regardless of their mobile providers. To gain access to the network users did not have to fill in a form to register, there was no restriction on the access to the “00000Japan” free service as it was specially put in place for emergency situations. Although connecting to Wi-Fi is as easy as child’s play for its users, setting up a big Wi-Fi infrastructure is much more complicated. During the Kumamoto earthquake that occurred recently, the Wi-Fi infrastructure had to answer to the needs of tens of thousands of people, while also being compatible with different devices. The signal’s transmission had to be powerful too, to enable people to use messaging applications such as “Line out”, a free service that allows users to make domestic calls of up to 10 minutes. Additionally, Wi-Fi was needed also by people who did not have access to a TV and needed to follow live streaming news on their personal devices to stay updated about the current situation. Nowadays, thanks to free Wi-Fi connectivity, those in a disaster area can keep in contact with their families and inform them that they are safe during an emergency situation, and with social media, news can be spread in less than 2 minutes. 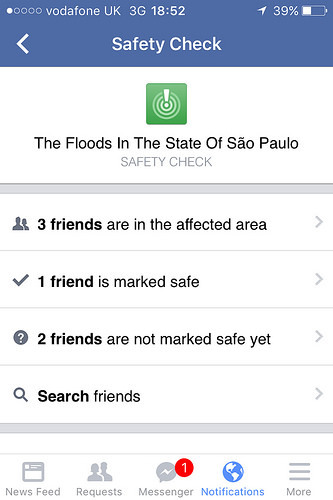 One example is the very well-known “Safety Check” service provided by Facebook that is helping people check if their friends and relatives are safe when natural disasters or terrorist attacks occur. The idea is that Facebook can determine whether or not someone is in an affected area based on the users latest registered position. If the user is in fact in an affected area, the application allows them to notify others that they are safe while also allowing them to check on the safety status of other friends or relatives in the affected area. Facebook’s “Safety Check” is a great example of how important information can be passed through social media. Another similar example is Twitter, the ideal social network for quick and immediate updates and Periscope, an application that allows live video streaming. Being informed and able to communicate through any one of these platforms is a priority during an emergency situation. This is only possible thanks to free public Wi-Fi initiatives, like “00000Japan”, that facilitate communication for the people in affected areas.